Deep within every marriage is a God-given desire for intimacy. By God's design, romance is supposed to be the flame in the fireplace of marital intimacy. Yet far too many Christian couples feel cheated because their marriage produces as much spark as a book of wet matches. Others have neglected to fan the flames of passion for so long that they have lost hope of experiencing romance. 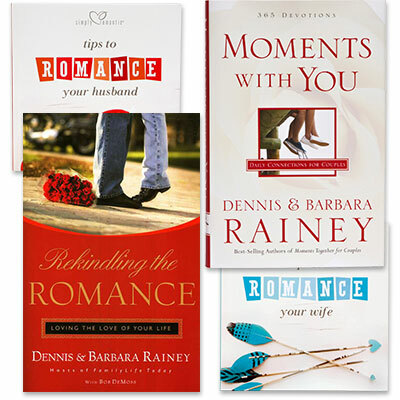 Rekindling the Romance is a collection of short, easy-to-digest, biblically based chapters. Packed with practical insight, this tastefully candid and inviting resource provides the Christian couple with the keys to unlock their relational and sexual intimacy. Need help to keep the spark alive in your marriage? Tips to Romance Your Wife is filled with ways to tell her, “I love you more than ever!” These ideas will draw you closer together while having fun. Learn how to give romantic gifts and add a passionate twist to birthdays and holidays. Plan creative dates using bubble bath, creative games, postcards and more..